If you'd like to join our wait list, shoot us an email and we can set up a time to chat by phone. Given the scarcity of Danish-Swedish Farmdogs in the USA, the expense involved in importing breeding stock and out of respect for the precedent set by the European breeders, our pet puppy pricing begins at $2500. Puppies that have begun their leash training, crate training and socialization are priced accordingly. Companion trained adults usually start at $3500 and are only occasionally available. Show and breeding stock "to the trade" only, pricing and contracts by private agreement. The breed club websites below may help you find a responsible breeder and a well raised Danish-Swedish Farmdog. Alison Smith (Paradox) is a Breeder member in good standing and current (2018) Vice President of DSFCA. 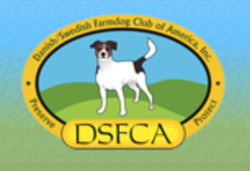 Danish-Swedish Farmdogs USA (DSFUSA) is a dog breed club devoted to the ethical promotion and preservation of the Danish-Swedish Farmdog, a versatile and rare working dog breed. Alison Smith (Paradox) is a Regular member in good standing.